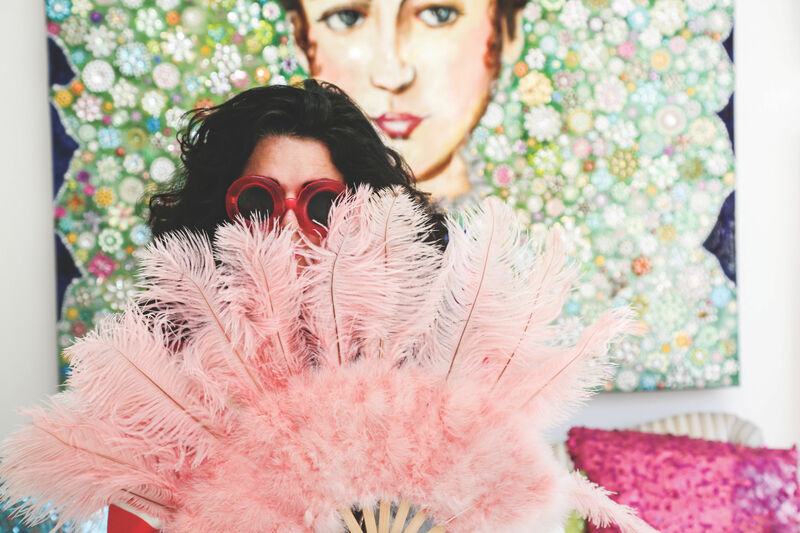 FOUND DANCING, PAINTING AND BEDAZZLING, the term pop artist encapsulates who Ashley Longshore is—pops of color, pops of huge personality, pops of fearlessness and, of course, pops of Veuve Clicquot. A glance into the windows of her Magazine Street gallery makes your knees weak. There’s so much beauty and life to take in: natural light, glossy pink floors and walls lined with Ashley’s canvases and bedazzled cut outs of hearts, butterflies and luna moths. My first time viewing one of her paintings is a memory I’ve never been able to forget. We were shooting a breathtaking design home in the Lakefront area, and there she was. The stunning Audrey Hepburn under the foyer staircase. Jeweled to perfection, she made a simple sitting area gleam with interest and color. I kept returning to the foyer to see her while the photo shoot continued. Speaking of women, one of Ashley’s many series is The Audreys. The beautifully elaborate silhouette of Audrey Hepburn is accompanied by whatever has inspired Ashley that day. Birds, butterflies, koi fish and detailed floral headdresses can be seen atop Audrey’s head. The background often varies from solid colors to related scenes to silver or gold leaf, like our cover of Audrey with blue birds and Japanese magnolias. “Audrey Hepburn was a philanthropic and beautiful woman, who to me is just a vessel representing something that I think every woman would want to be,” Ashley explains. “Whoever you are, I think it translates. 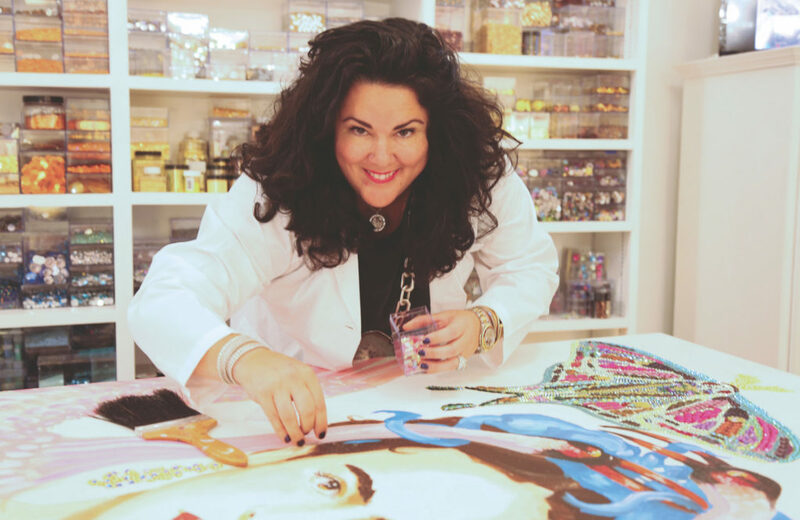 Beauty is universal.” Other women who often appear on Ashley’s canvas are Frida Kahlo, Kate Moss, Anna Wintour and, of course, Wonder Woman. Ashley’s gallery and studio have been open over seven years, but she has been painting for more than 20. “When I first started, I thought that galleries were the only way I could sell. I guess it takes someone like me to say, ‘wait, we don’t have to do it that old way.’ I had to do it this way, because I honestly can’t tell you how many galleries told me I wasn’t marketable. Not that it’s important, but it feels nice.” Her gallery is filled with finished and in-progress works, but few stay for very long before going to live in their new homes nationally and internationally. Ninety percent of Ashley’s paintings leave New Orleans. The combination of artist, businesswoman, fashion collaborator, furniture designer and now writer is quite the example of a badass woman. Ashley’s book You Don’t Look Fat, You Look Crazy, published by Regan Arts, released in February with 160 pages of art and Ashley’s story so far. Also in the works are three global collaborations that are set to launch in 2018 and 2019. Through whatever medium—canvas, Instagram or paper—Ashley remains humble in her successes. See Ashley in action at Art for Art’s Sake on October 7 from 5-9pm. 4537 Magazine Street, New Orleans. 504-333-6951. ashleylongshore.com.